At the forefront of sustainable commercial food supply, Whole Foods Market is constantly rolling out fresh, new ways to change the game. Enter Whole Foods' newest addition to their 50,000 SF Bridgewater, NJ store at Regency's Chimney Rock: a mini mushroom farm. 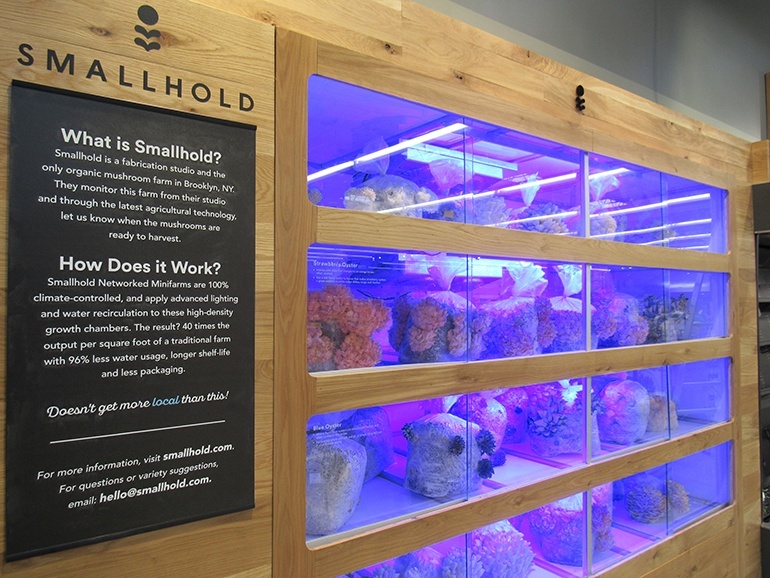 Spearheaded by Smallhold, an emerging Brooklyn-based company that implements mini farms across a variety of restaurants, the farm will produce upwards of 120 pounds of mushrooms each week for Whole Foods — its first official retail partner. Initially grown in nearby farms, the mushrooms are delivered to the market at their final growth stage, enclosed in a glass case and displayed along a produce wall. With a glowing light that is sure to captivate the eyes of passersby, Smallhold’s vertical farm unit resembles that of a fish tank.